General: As a supplier to Gaum Inc., it is understood that your organization agrees to meet the following stipulations / AS9100 requirements whenever a Gaum, Inc. Purchase Order specifies that the order is for an aerospace application/job (or contains some similar aerospace/AS9100 reference). These requirements are, therefore, to be considered as terms and conditions to all aerospace purchases. All suppliers to Gaum Inc. are expected to implement a quality system and will provide Gaum Inc with evidence of an established system. Where required on the Gaum Inc. Purchase Order, its suppliers must use Gaum Inc.’s customer-approved special process sources. Suppliers shall ensure appropriate competence of its personnel, including any required qualifications, when applicable, to provide additional confidence of the conformance of purchases. Suppliers shall ensure its personnel are aware of their contribution to product or service conformity, their contribution to product safety, and the importance of ethical behavior. Gaum Inc. monitors supplier performance, including both on-time delivery, and quality of purchases, and may react accordingly based on performance concerns. When applicable, Gaum Inc. retains all rights and controls regarding design and development activities of purchases, and supplier agrees to abide by Gaum Inc’s direction. Gaum Inc. is to be contacted (by the supplier) in the event of nonconforming product/material. Arrangements for the approval of supplier nonconforming product/material must be as directed by a Gaum Inc.’s authorized manager or designee. Furthermore, the supplier is required to notify Gaum Inc. of any changes to a product and/or process and to obtain approval from an authorized Gaum, Inc. manager or designee (if applicable). Gaum Inc., their customers, and regulatory authorities retain the right of access to all supplier facilities involved in the aerospace order and to all applicable records. The AS9100 standard requires that all applicable customer/regulatory/AS9100 requirements for the supplier to flow-down to sub-tier suppliers (includes requirements in the purchasing documents and key characteristics where required). However, Gaum Inc. does not allow its aerospace suppliers to subcontract any product or process to a sub-tier supplier without Gaum Inc. expressed written consent. 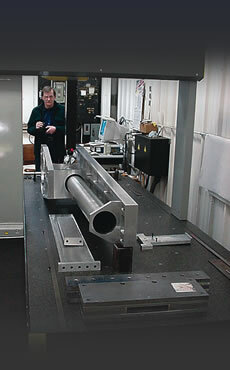 Gaum Inc. performs inspection activities to ensure that purchased product meets purchase requirements. They may include: Receiving inspections (of supplier products / services / documents) may be / are performed by a designated employee. Gaum Inc. verifies the authenticity of the appropriate certificate of conformity, material certificates, etc. and other accompanying documentation by review and comparison (as is appropriate) to the drawing and/or industry specifications or by other means. When necessary, Gaum, Inc. may inspect or audit at the supplier’s facility. Furthermore, products are inspected to ensure they meet requirements (dimensions, etc.) and the results are recorded (as appropriate). All special processes (anodizing, heat treat etc.) where the compliance cannot be verified by inspections will require a Certificate of Conformity. When appropriate, Gaum Inc. may delegate the inspection authority to one of its approved suppliers. Gaum Inc. will communicate the inspection requirements (including approved monitoring and measurement equipment/methods) and Gaum Inc. will maintain a record of those approved to carry out such inspections. When Gaum Inc. or its customer intends to perform verification at the supplier’s premises; Gaum Inc. will first state the intended verification arrangements and the method of product release. This information will be communicated on the Gaum Inc. Purchase Order or via another acceptable purchasing arrangement. Where specified in the contract, the Gaum Inc.’s customer or customer’s representative will be afforded the right to verify at the supplier’s premises and Gaum, Inc.’s premises that subcontracted product conforms to specified requirements. Verification by the customer is not used by Gaum Inc. as evidence of effective control of quality by the supplier and shall not absolve Gaum, Inc. or its supplier of the responsibility to provide acceptable product, nor shall it preclude subsequent rejection by the customer. To prevent the purchase of counterfeit or suspect/unapproved products and to ensure product identification and traceability (and for other reasons), Gaum Inc. will institute controls that include the requirement of Material Certificates, Certificates of Conformity, and/or other supporting documentation from its suppliers as is appropriate. These requirements may be specified on Gaum Inc.’s Purchase Order or may otherwise be communicated to the supplier. Gaum Inc. may also require specific actions where timely and/or effective corrective actions to a supplier issue(s) are not achieved. These actions may include but are not limited to any or all of the following: withholding payment until the issue is resolved, removal of the supplier from Gaum Inc.’s Approved Supplier List, and legal actions. Gaum Inc. requires all documents be retained for 10 years.